Structured data is a way of formatting HTML that uses a specific vocabulary, telling Google how to interpret your content, and how to show it on the results page. Structured data lets you enhance your search listings in a few ways. Think Knowledge Graph panels and rich snippets. The latter can increase your page’s click-through rate by 30 percent. Multiple real-life experiments show an increase in clicks helps boost your ranking. With search results getting and looking more diverse, you can’t miss the opportunity to stand out. In fact, you should get on it soon before your competitors do. Speed is big. No, serious. Not only is it a major ranking factor, it’s a large user experience factor. User experience, in turn, affects rankings. It’s a never-ending circle! So how fast is fast though? Google expects your page to load in three seconds. But how do you make that happen? Firstly, take Google’s speed page test. The test can then be integrated into WebSite Auditor, a free site that analyses your page bit by bit. It shows a selection of on-page factors calculated for you. Scroll to technical factors, and then page speed. For any problematic factor, there’s a how-to-fix-it option! AI and machine learning are, as we speak, altering how search results are ranked. Machine learning can also facilitate the way searches take place, giving more contextualised results. 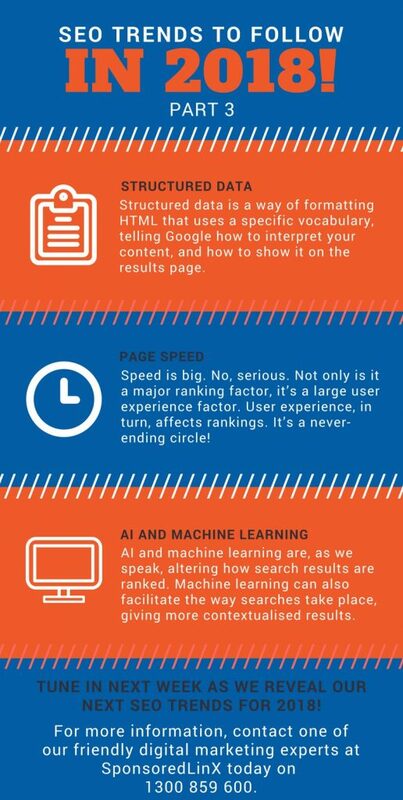 This, in turn, leads to a more personal experience, while the rise of voice search can offer the platform to develop artificial intelligence and reward successful SEO strategies that are sticking with the trend. And, with Google’s rampant determination to develop in this area, it’s clear there are many more innovations on the way. SEO is an ever-evolving concept. One trend can last a lifetime while others can change the next day. It’s important to keep informed as you must adapt to survive otherwise you can get lost amongst a sea of other results on search engines. Don’t forget this is all part of a bigger series we’ve been publishing for the past two weeks and something we discussed in a webinar earlier in the year.